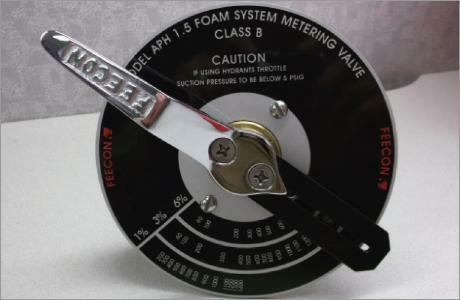 The Feecon Around-the-Pump Proportioner is a simple and inexpensive way to add foam capability to all discharges of a truck. The AP System design diverts 85 gpm of the water pump’s output from the discharge side of the pump and sends it through an eductor. A vacuum is created at the eductor’s foam concentrate inlet, which draws foam concentrate through the metering valve and into the eductor. This foam/water mixture is then sent to the suction side of the water pump where it mixes with the incoming water and is distributed throughout the discharge piping.